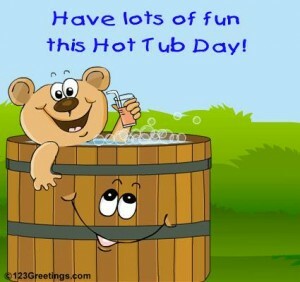 The good news is today’s National Hot Tub Day! The bad news is today is Thursday. So no hot tub partying tonight probably. But that doesn’t mean you can’t celebrate the fun and health benefits of hot tubs on a better party day. Like all special celebrations, we’re free to host an event any day that works best for us. And, just like in dining, a “pop-up hot tub party” should, by definition, be flexible and a bit of a surprise to everyone. Q: Do I Have to Own a Hot Tub to Have a Hot Tub Event? Not only will we deliver it, but we’ll set it up and show you how to operate it successfully during your rental period. Q: What If Our Home Location Presents a Challenge? 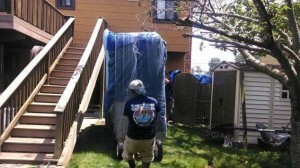 Best Hot Tubs (as you see for this Long Island, NY location) is truly expert at deliveries. We have a special dolly and custom trailer. As long as we have a minimum of 40” of width and 9’ of height — we simply lower the dolly gently, then tip it on its side to move it into place. On rare occasions, it may be necessary to prepare the path by removing awnings, or a few tree limbs, etc. And, if absolutely necessary, a crane can be employed to drop the hot tub in the yard. But we handle challenging deliveries all the time. We’ve not failed yet. 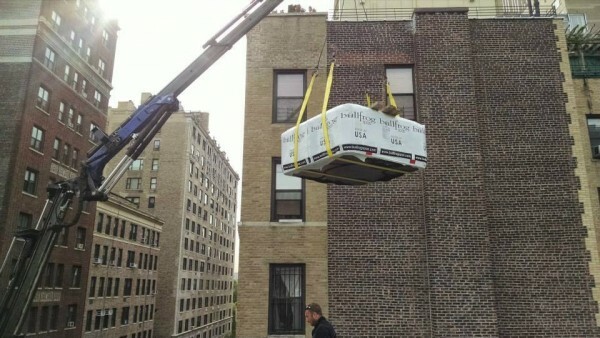 As you can see, even if you live in a high-rise in the city, we can get your hot tub there. Q: How Much Does a Hot Tub Rental Cost? 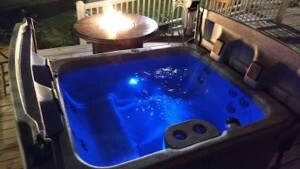 Depending on the size of spa you want, etc., our hot tub rentals cost between $299-$799. And if you want to add a bit of atmosphere, or just warmth for a cool night, we even have fire tables or fire pits for rent as well. A fire table can add a lot of ambience to a pop-up hot tub event or at any time. The spa pictured here is a rental from our Windham showroom in the Catskills. 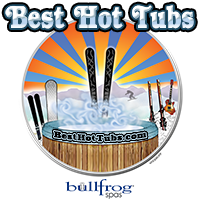 The following video shows Bill Renter, owner of Best Hot Tubs, along with one of our hot tub technicians, delivering a rental during weather that wasn’t very accommodating. 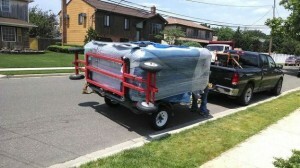 We are just as reliable in delivering our rentals as we are when someone purchases a Bullfrog Spa from our showrooms. So a pop-up hot tub party, in celebration of National Hot Tub Day — or for any reason — is as easy as leaving it all to us!